Jeanine was originally from Los Angeles, and Leo hails from North Attleboro, MA. They lived “back east” for 30 years before Jeanine was able to convince Leo to come to the “correct” coast. They have one son, Mark, who's 38, and lives forty minutes away. They have no pets (Jeanine is allergic to cats and dogs), but son Mark has a Palomino rabbit named Amber. Asked about her favorite memories or experiences at SFUU, Jeanine said “anything to do with music and our church community. I especially loved the music night a few years ago and karaoke. Actually, anything we do as a group is welcomed … Anything we can do to gather together!” She also loves Facebook and Churchies. 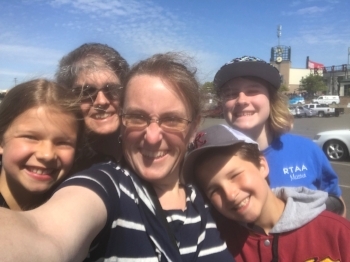 Jennifer Warner came to SFUU 9 years ago when she and her wife Nicole were looking for a spiritual community that would be right for their family. They wanted an accepting community that would help them raise thoughtful, compassionate children. Their oldest daughter was 4 at the time and the younger twins were 2. When Jennifer is not chauffeuring children (now 13 and 10) she likes reading for relaxation and travelling. Jennifer has held several leadership positions at SFUU and currently serves on the Search Committee. Chelle Kucera and Bill Boyce first discovered Sierra Foothills Unitarian Universalists at a Festival of Lights parade. They were drawn to the joy on the faces of the people they saw walking and singing and decided to investigate further. Chelle wanted to be part of a community and Bill, who had grown up Catholic, originally started attending SFUU to be supportive of her. When they first started attending, Harriet was the youngest regular visitor and she got lots of attention. They were looking for a place that put an emphasis on children and would be fun for their daughter, who is now 4. They loved having her spend time around strong, funny girls who influence her in a positive way. When they came to this area, Chelle bought a pediatric dental practice in Grass Valley and works there three days a week. She is opening a second office in Lincoln soon and will work there the other two days. She likes working with kids in her practice because they are so much fun. Chelle loves to read, and is delving into books about marketing and business right now. 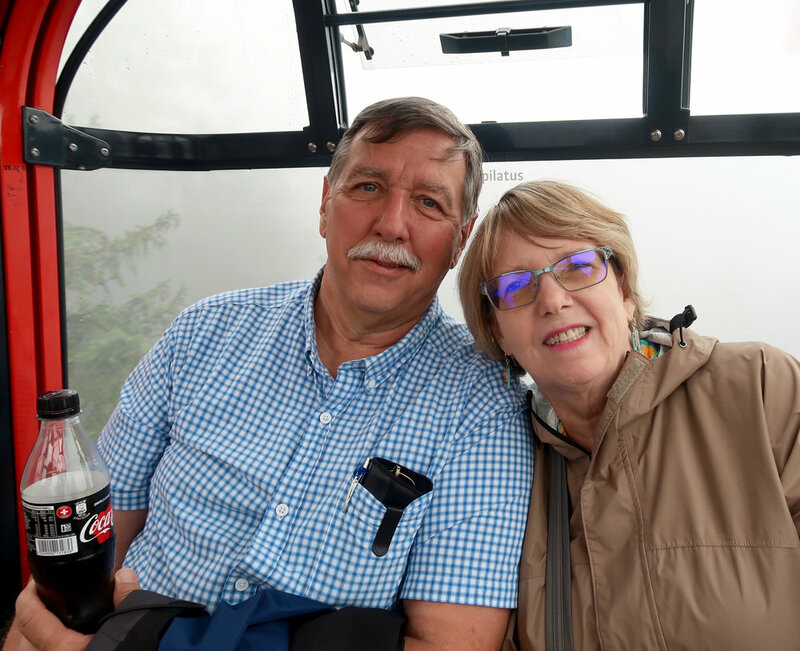 Both Chelle and Bill appreciate the social connections they have made here, especially with other parents. They take what they call the coffee walk to Baked and Brewed in the City Square after church most Sundays with other families with children. The parents get to talk and the kids are safe to run around together within eyeshot. When I moved to Citrus Heights I discovered that it was a 30 to 40 minute drive to either Sacramento or Auburn. I choose to attend the Auburn Church because I feel more comfortable at a smaller church. Perhaps this is do to the fact that I was brought up in a small town (Belmont, New Hampshire, population 1,500) attended a small school (20 kids in my class) and my mother took me and my sister to a church which had a small congregation. I appreciate SFUU because the religion that is preached here is based on shared values and principles rather then on any particular dogma, creed or belief. I got into baking because I was born with a sweet tooth. I have always believed that the best part of any meal was the dessert. It was natural that the next step for me was to start baking myself. I soon found baking to be a very rewarding hobby. It is very satisfying to take a group of diverse ingredients, mix them together, bake them and end up with a delicious creation. I enjoy bringing baked goods to share with members of the SFUU community because I think of refreshments after the service as being the final act in an rewarding worship service that has included beautiful music and inspiring sermons. David & Kia Hatch moved to Roseville from their home in Rough and Ready about a year ago and they are exactly halfway between SFUU and the UU Society of Sacramento. They visited both, but chose SFUU because it has a more intimate feeling. Working together to build community is very important to Kia and she hopes to continue to do that at SFUU so she became a member this spring. Kia, an Art History major at San Jose State University, was engaged to another man when she met David, who was teaching art there. When she met him, she knew he was “the one” and they’ve been married 52 years. After graduating, Kia didn’t have a career plan in mind, but she interviewed with Pacific Telephone and Telegraph in San Jose and was hired. That began a 25-year career with the company, where her strengths were project management, budget development and data integration. David is an artist who is accomplished in many different disciplines. He has worked in and taught pastels, oils, sculpture, ceramics, glass blowing, basketry, leatherwork, silversmithing. He also lectured on Art History, which gave him more time for his own art. He’s been called a Renaissance man and he says the downside of that is that you don’t get known for one thing. He is still making art and recently fired some things in his kiln in his studio. “When I open a kiln it's just like Christmas," he says. Still active in his studios, he travels back to Rough and Ready several times a month to work on projects. Kia says David taught her how to travel and they’ve been around the world together. They have camped in snow at Half Dome and lived out of a ’66 VW bug for 3 of the months they were traveling in Europe. David traveled to Burma as a Fulbright scholar. He is a musician with a setup of instruments in his home. Kia says one thing that brings her joy is to hear David playing and singing. Kia discovered the joy of quilting in the ‘70s and she went on to teach and lecture on quilt making. She still maintains an active quilt studio. When they lived in Rough and Ready, Kia was a member of UU Community of the Mountains. Though David thinks of himself as a non-theist, he was also active at UUCM, including becoming the videographer of Sunday services to be aired weekly on local TV for several years. People often ask, what brought you to SFUU. For the me answer is easy. Free childcare! Now before you consider me shallow, take into account I was the mother of a two year old, pregnant with my second child, and living in a new town with my husband, running our own business. As such, there were few opportunities to meet new people and expand my circle of friends. I remember one day picking up the Auburn Journal and seeing that there was a UU church here!When I saw that the meeting time was at 4:00pm on Sundays I knew I had to go! It was prime football watching time, my hubby would be content, and I realized that for at least an hour I could perhaps rejuvenate my soul, meet new people, and for a blessed hour or so I could be…child free! What a deal! So off I went, and the rest is history.